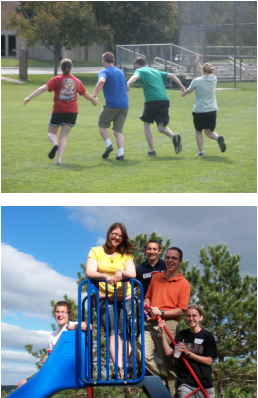 A Totus Tuus team is comprised of four college-age young adults that give their summer for the service of Christ and His Church. There are two women and two men, often seminarians, on each team. A team leader and co-leader are designated. Teams stay at host families throughout the summer and receive a stipend in addition to room and board. Each team member commits to a summer of prayer, sacrifice, vocational discernment, and service to Christ and His Church. The teachers sign a “covenant” in which they promise to be open to God’s will for them and to actively discern it. Because the teachers are striving to live an authentic Christian life and are actively discerning their vocation, they can better help the youth to do the same. The summer begins with a week-long training session in which team members learn the summer's curriculum as well as songs, games, skits, and practical tips for life on the road. The team travels to eight parishes over the course of the summer, with a week-long break over the 4th of July holiday. There is a mid-summer retreat and end-of-summer retreat for the spiritual formation of the team. Team members pray the Liturgy of the Hours together daily, as well as the Rosary and Chaplet of Divine Mercy. Team members share the various responsibilities of life on the road including: giving parish announcements at Sunday Masses, leading songs and games for kids, planning and teaching lessons, acting in funny skits, playing with kids at recess, practicing Mass readings with student lectors, preparing youth for Reconcilation, and sharing their testimony with the teens. Teams also take time for fun during their daily and weekend breaks - this includes anything from playing frisbee to kayaking and from bowling to milking cows!